it's never too late to celebrate gay pride! 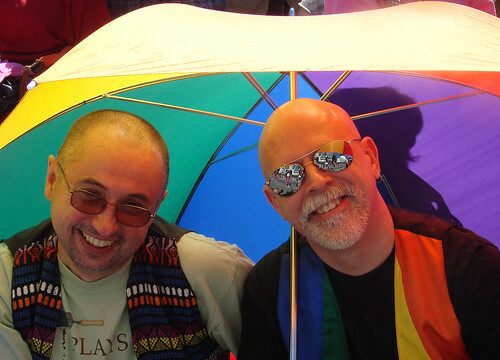 This entry was posted in queer talk, gender issues and sexual identity, wordless wednesday and tagged gay pride, photography, vancouver pride parade on August 5, 2009 by isabella mori. Hooray! What a happy looking couple. hi sandy and surve – thanks for the comments! now i’m off to look at your post, curve. .-= isabella mori (@moritherapy)´s last blog ..rainbow couple on a wordless wednesday =-. Hi Isabella!!! I just love this picture. It brought a smile to my face. Yes, it is never to late for anyone. Eventually, I will write a post as to how, as a Christian, I am now a Gay Rights Supporter. .-= ClinicallyClueless´s last blog ..Health Update ~ Waiting!! =-. hi CC, long time no see! looking forward to that post – let me know when you have it up! It is good to be somewhat back on the blog scene. I’d like to read that article too!! 🙂 The last six months, have been quite difficult…if you want to skim or read my blog, it will explain. It has been one thing after another. .-= Kevin McCarthy´s last blog ..Restalyne Wrinkle filler =-.